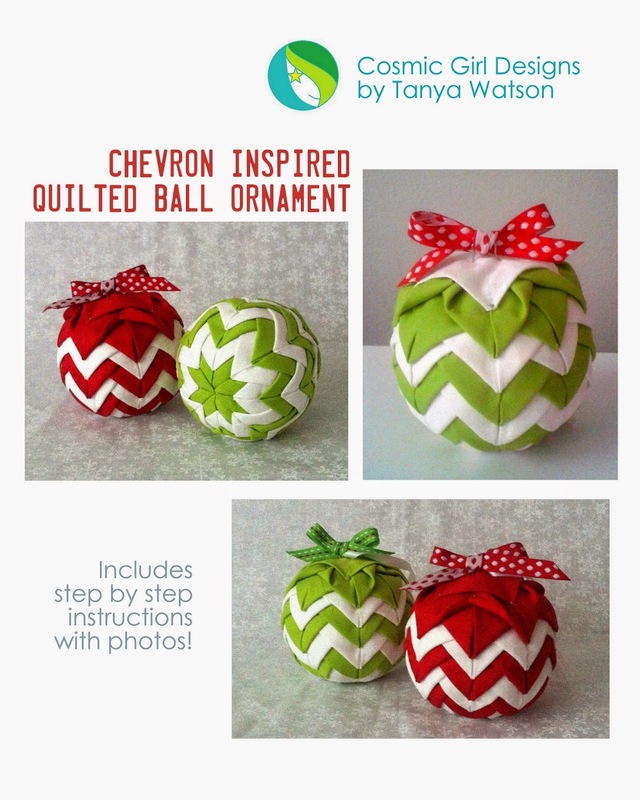 Quilted Ball Ornament - Chevron Style!! 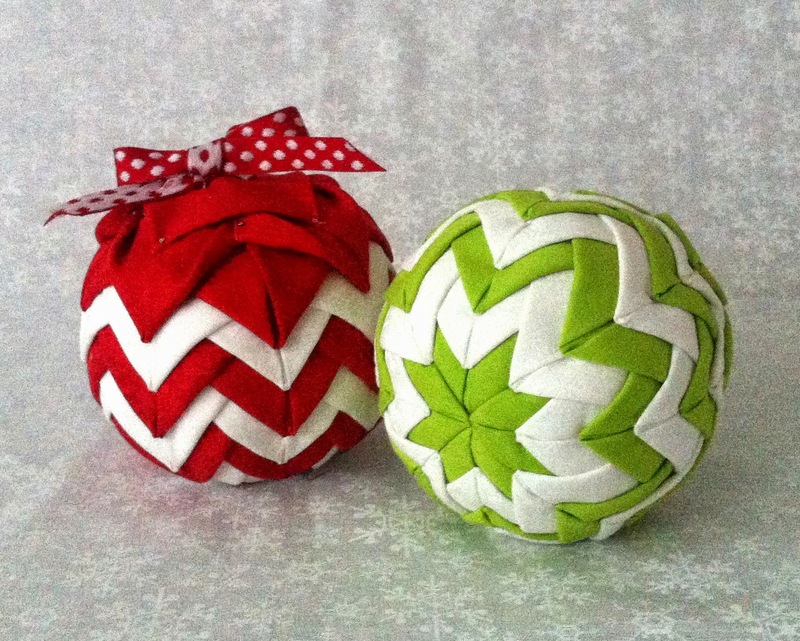 So Christmas is fast approaching and so many people at the quilt shop I work at, have been asking me if I’m going to teach my Quilted Ball Ornament pattern like I usually do around this time of year. But this year I was inspired to make up a new ornament pattern. 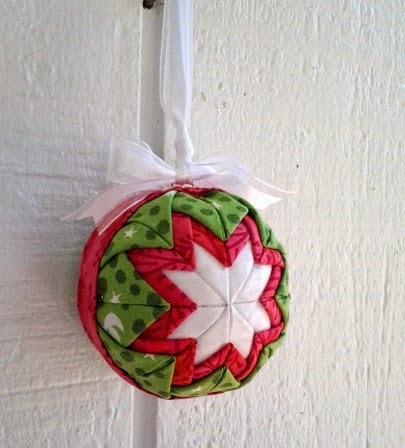 My Chevron Quilted Ball Ornament is a fresh modern take on the original; more traditional looking pattern. While there are some similarities between the two (squares are folded the same); this new version goes together quicker; it only uses two different colored fabrics and is assembled differently. Every time I look at the Chevron pattern created by the contrast of the two different colors; it puts a big smile on my face. It took me around two weeks – off and on – to make the samples and write this pattern and now I’m so excited to have added it to my Craftsy pattern shop. 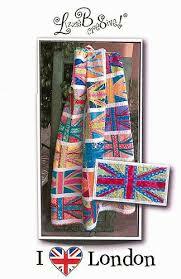 I can’t wait to show my new creation off at the quilt shop…hmm sounds like it’s time to teach another class! 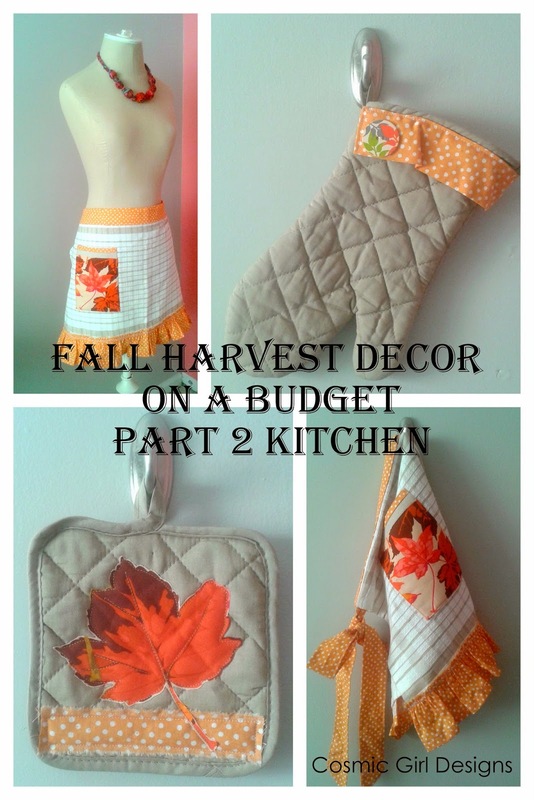 Welcome to Part 3 of my Fall Harvest Décor on a Budget series! 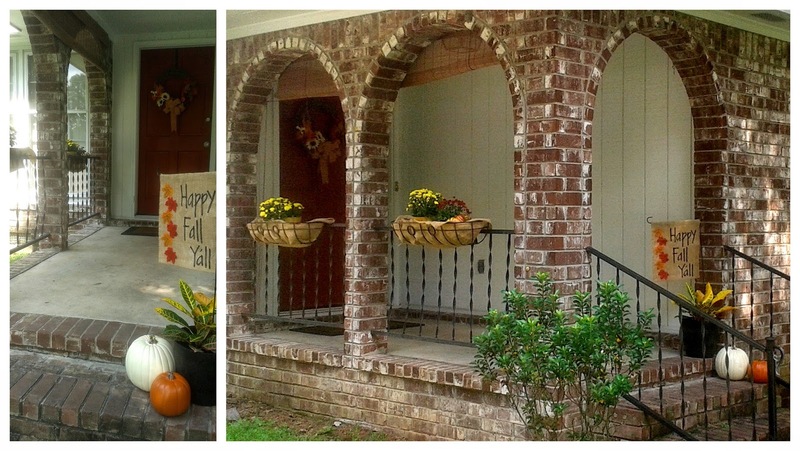 In continuing my harvest decorating extravaganza, I decided to spoof up the entry way that leads up to our front door. 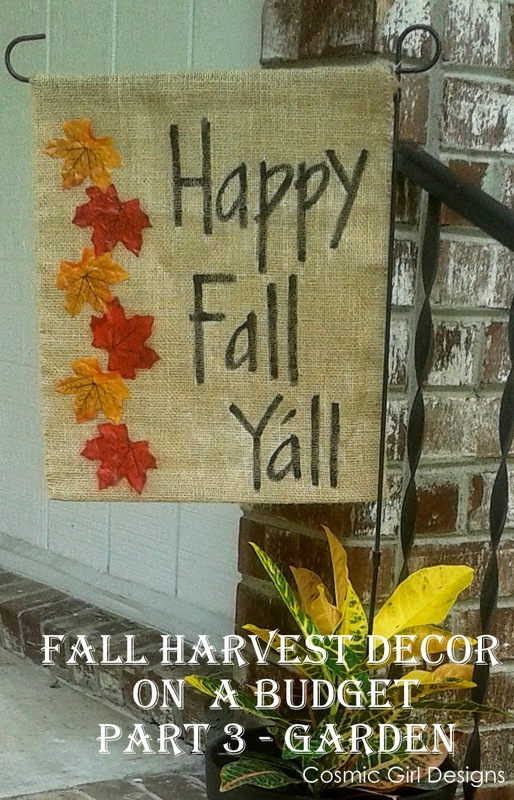 Follow Tanya Watson for Cosmic Girl Designs's board Fall Home Decor on Pinterest. Needless to say, I was super excited when I found a garden flag pole at Dollar General for only $3! I wasn’t really feeling the flags in the stores, so back to Pinterest I went for more inspiration. 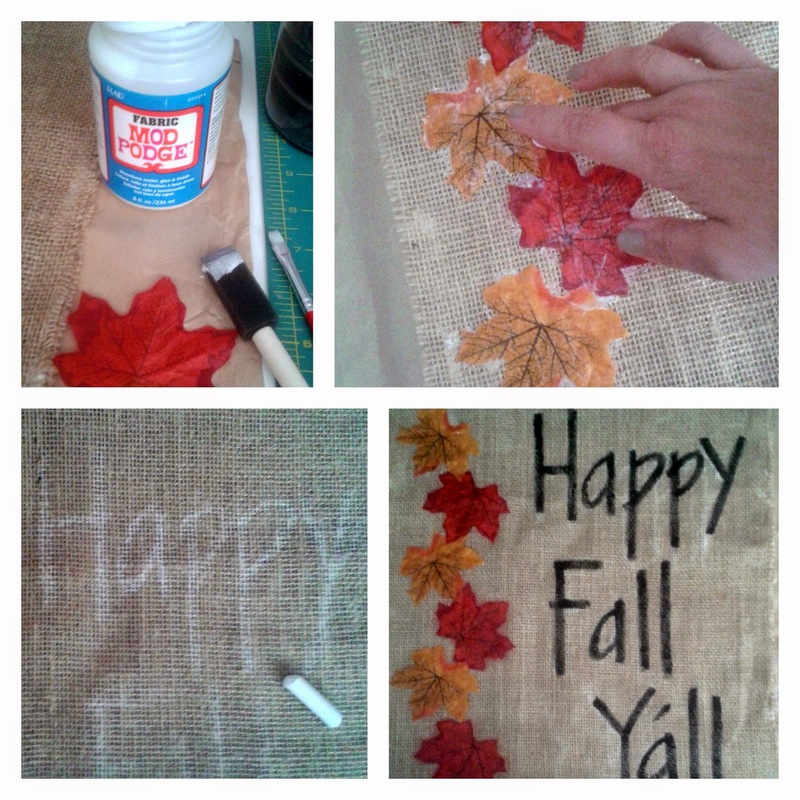 I found a great post for a monogrammed garden flag at blissfullyeverafter.net that uses burlap. You can purchase burlap at any of the fabric or craft stores but my Wal-Mart had it for just $2.97 a yard! After some trial and error I decided to keep it simple and add some southern charm – since I do live in the south! J I used some Fabric Mod Podge to adhere the leaves and black acrylic craft paint for the lettering; both which I already had. Try using chalk to test out your lettering first – if you don’t like it you can easily rub it off and it the paint goes over it fine. The flag took less than a half hour to make and I love the way it turned out. Total cost was around $5 including the cost of the flag pole! 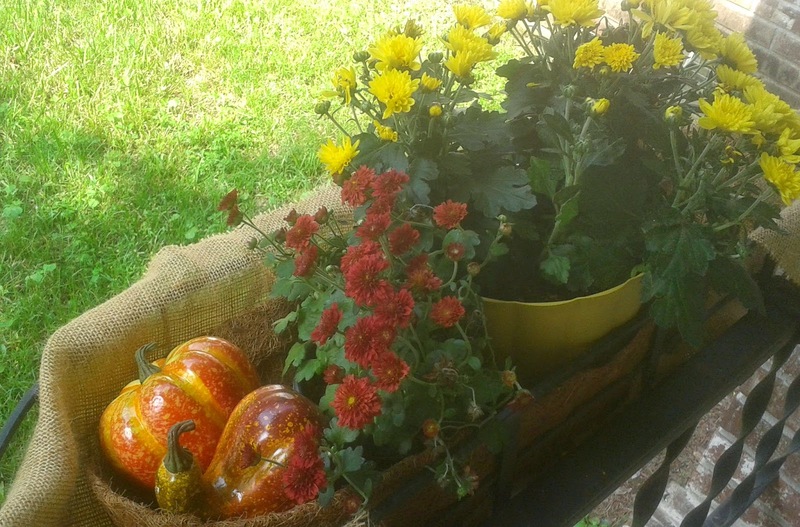 Now onto plants and flowers…while at Wal-mart I also found these yellow mums on clearance for just $2.99 ea and the smaller red mums were just $1.98 ea. I knew these would be perfect for our metal flower baskets. I lined the baskets first with the burlap and then some coconut liners I previously purchased over the summer. To save time and money on planting, I left the flowers in their pots since the garden specialist told me they probably wouldn’t last through winter. 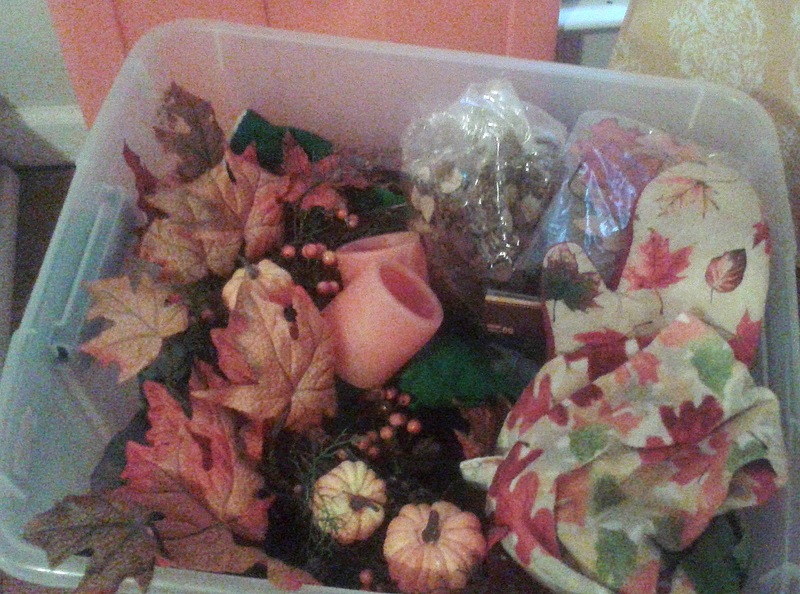 I added some small pumpkins and gourds which I purchased at Michael’s at half off. A Petra plant, which I purchased at Lowe’s for $5 was added to a flower pot I already had. I placed the flag in the pot so I could keep the flag out of the rain – we get a lot late afternoon showers here. I accented the pot with two pumpkins I also purchased at Michael’s at half off. I have to say it feels very welcoming now and I get a big smile on my face every time I pull up to my house. 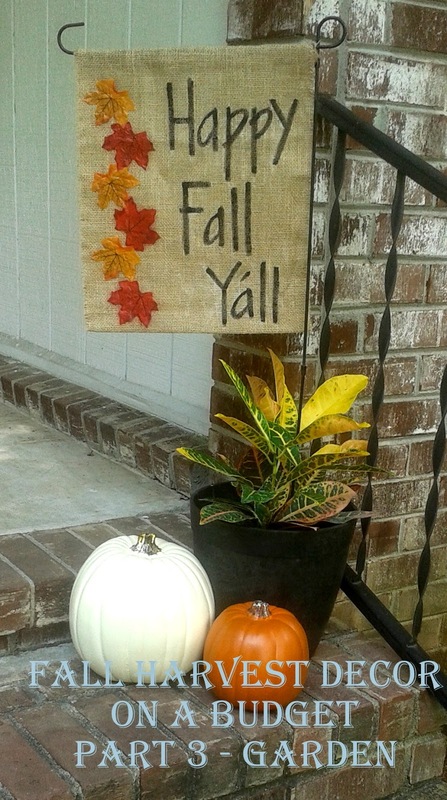 So here's the cost breakdown: Garden Flag $5, Plants $15, Pumpkins and Gourds $22, Burlap $3 - that's less than $50! 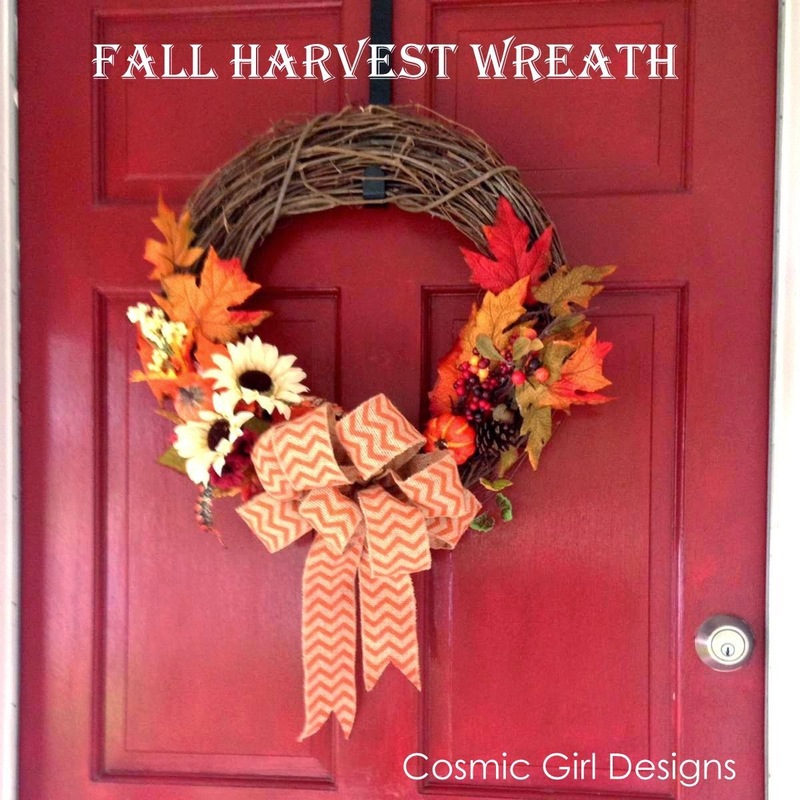 Be sure to check out my other posts Fall Harvest Décor on a Budget Part 1 – Wreathand Part 2 – Kitchen, if you missed them. 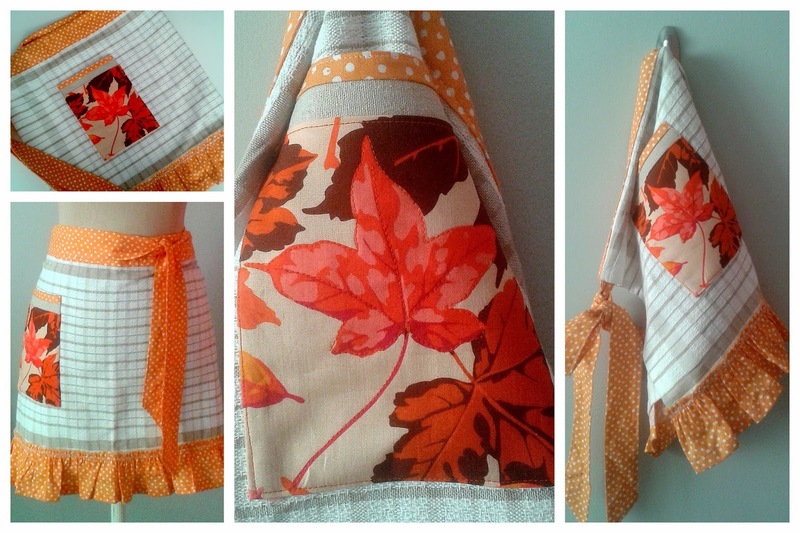 One of the things I love to do every season is change out my kitchen linens, which can get expensive so for Part 2 of my Fall Decor on a Budget series I decided to make an apron and coordinating oven mitts. 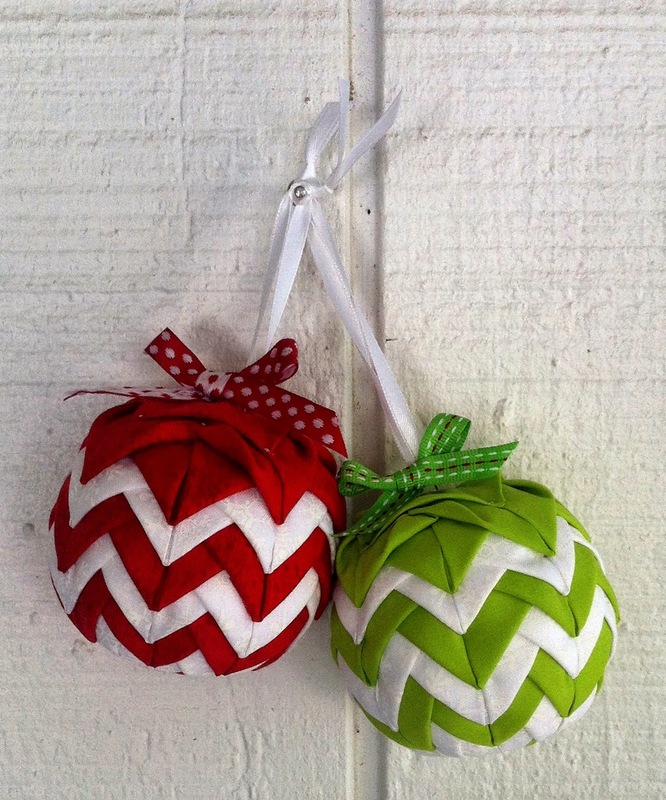 I decided to make them from a dishtowel and mitts I purchased for less than $5 total at Dollar General and the Dollar Tree. For the apron I used my dishtowel apron pattern which is super quick and easy. I just recently added it to my Craftsy pattern shop. 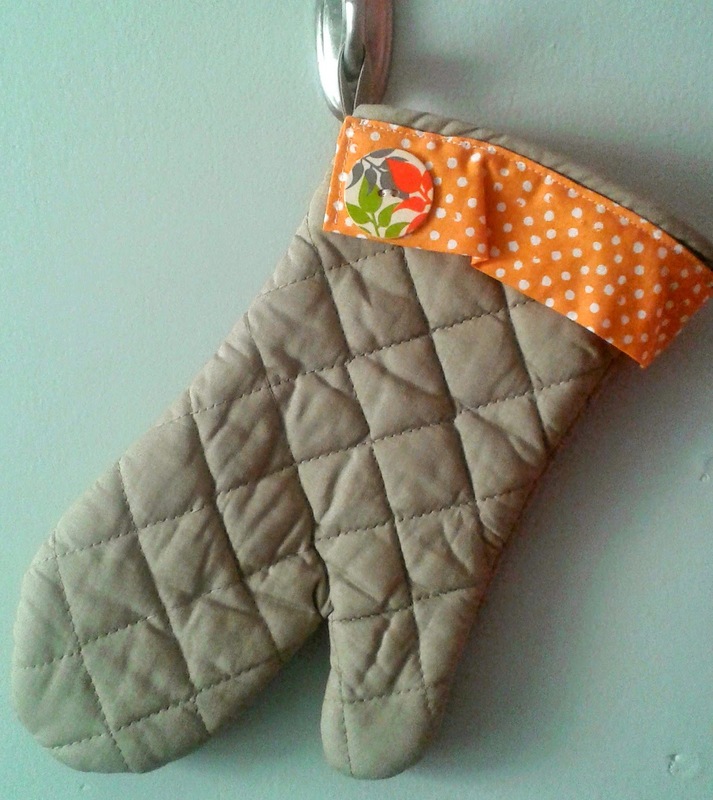 My dollar store oven mitts got a style upgrade with the leftover scraps from my apron. For the gloved mitt, I took a cue from a great post I found over at the36thavenue.com . For the square mitt I had some left over Kaffee Fassett fabric in a beautiful leaf print from making some valances for the windows above my kitchen nook last year. 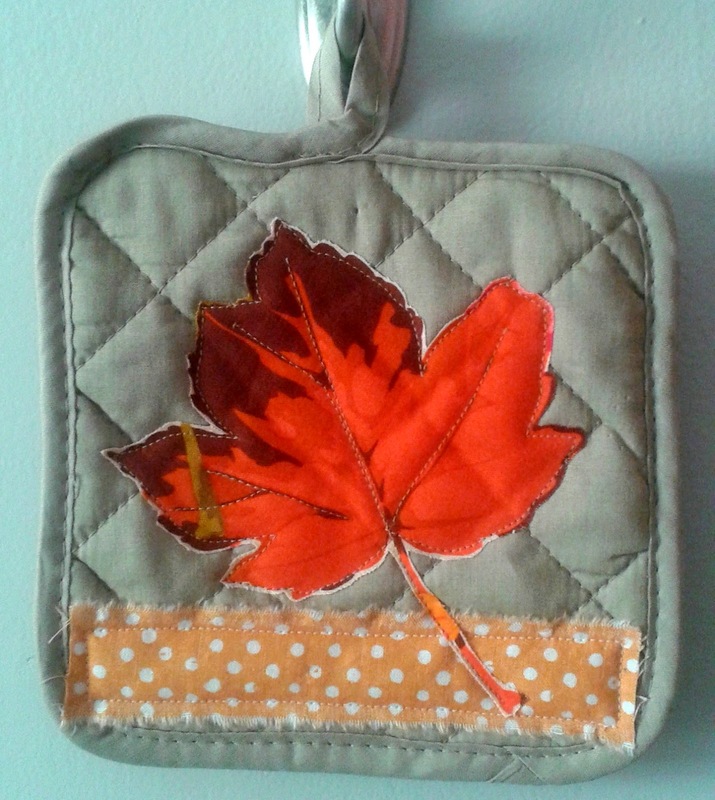 I found a leaf I liked and then ironed some fusible web to the wrong side of my scrap and then fussy cut around the leaf shape. 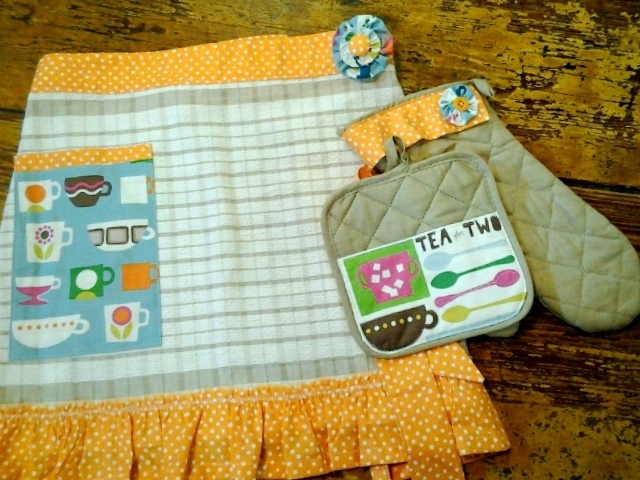 Next, I added a strip of orange polka dot fabric; left over from my apron project along the bottom of the mitt. I then machine stitched it in place and left the edges raw. Finally, I ironed leaf onto the square mitt and did some machine stitching along the outside edge and along veins for added dimension. I love these projects because you can quickly and easily transform discount store kitchen linens into fabulous kitchen accessories all for $10 or less and don't forget to use up those fabric scraps! 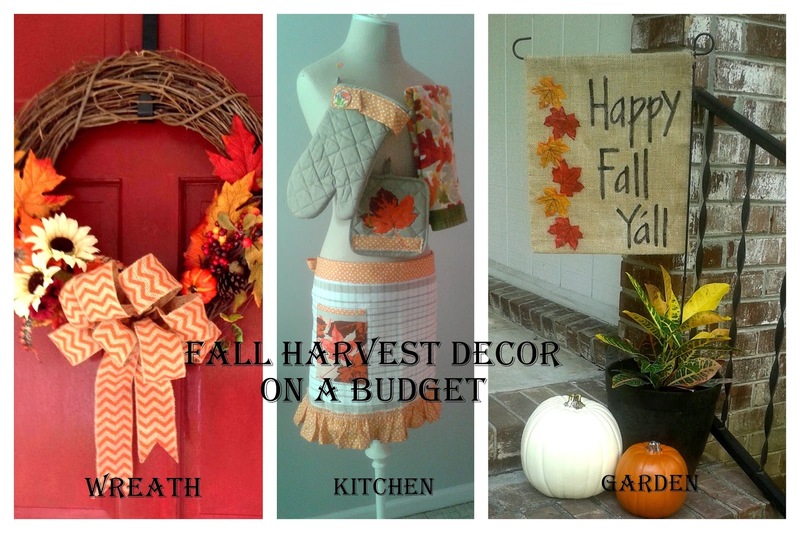 If you liked this post, be sure to check out my third post in this series - Harvest Fall Décor on a Budget Part 3 – Garden. I had some candles, a wreath, a leaf garland and some kitchen linens (basically a hot mess) all of which were fine (ok not really) but I decided they all (desperately) needed some updating and/or repurposing – or some shushing as some might say. For the wreath, the one I had in my bin was purchased from a discount store last year but after a recent trip to Michael's, I decided I could do much better but for a lot less money than they charge for their custom made wreaths; which start at around $50. So I purchased a cute chevron burlap bow and a couple of floral pics for under $10 (with coupons of course). 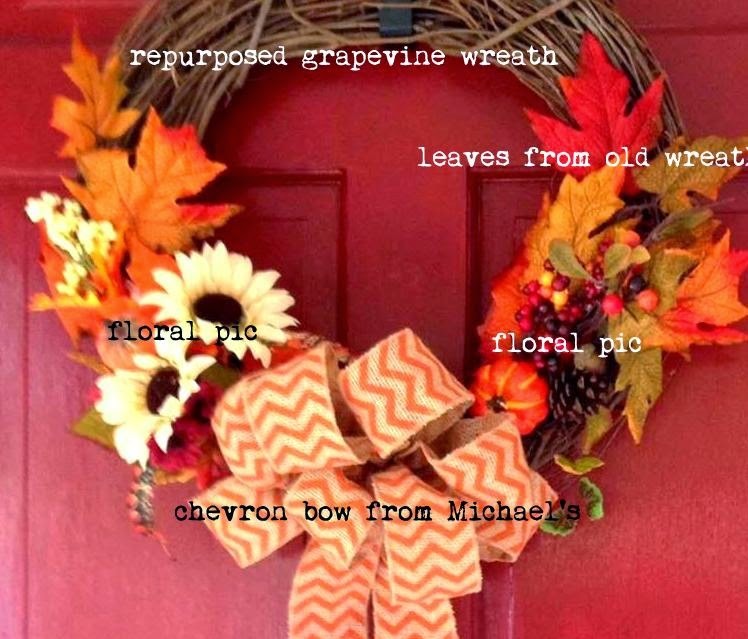 I basically pulled some leaves off my old fall wreath; repurposed a larger grapevine wreath I had packed away from spring; arranged the floral pics and added the bow for a finishing touch. No glue necessary – I simply wrapped the wired ends of the pics through the wreath and they stay nice and put. This way I can easily change it for next year. I’m pretty happy with the way it turned out and for around $10, I created a Michael's inspired wreath that I'm proud to hang on my door. 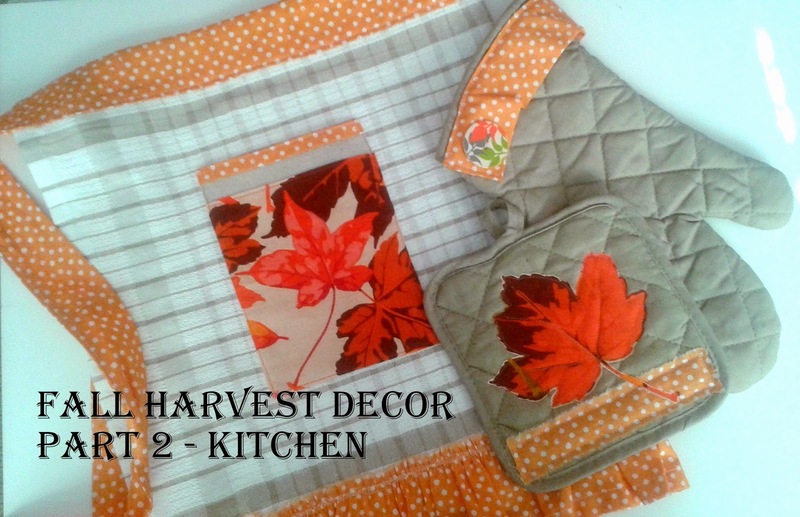 How about turning some dollar store kitchen linens from drab to fab...you can read more about in Part 2 of my Fall Harvest Décor on a Budget series. 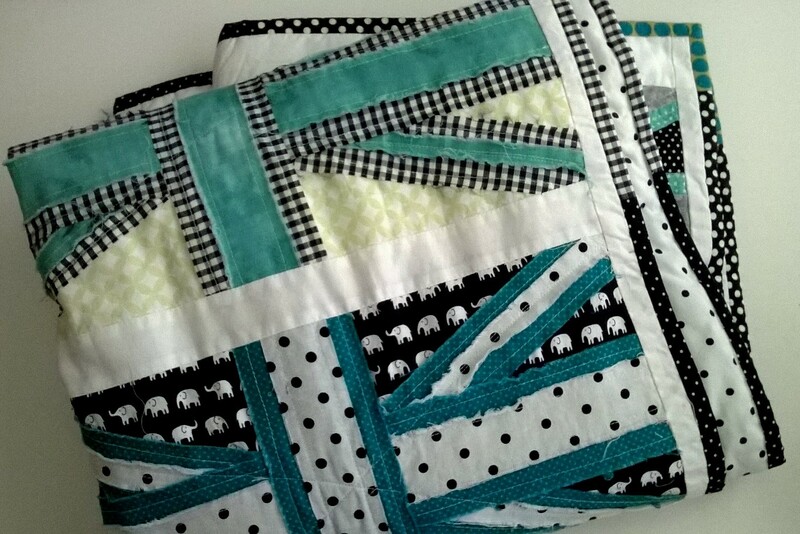 So I finally finished the Union Jack Quilt I made for my daughter Mackenzie’s 13th Birthday – which was all the way back in January (it’s now August :-P). 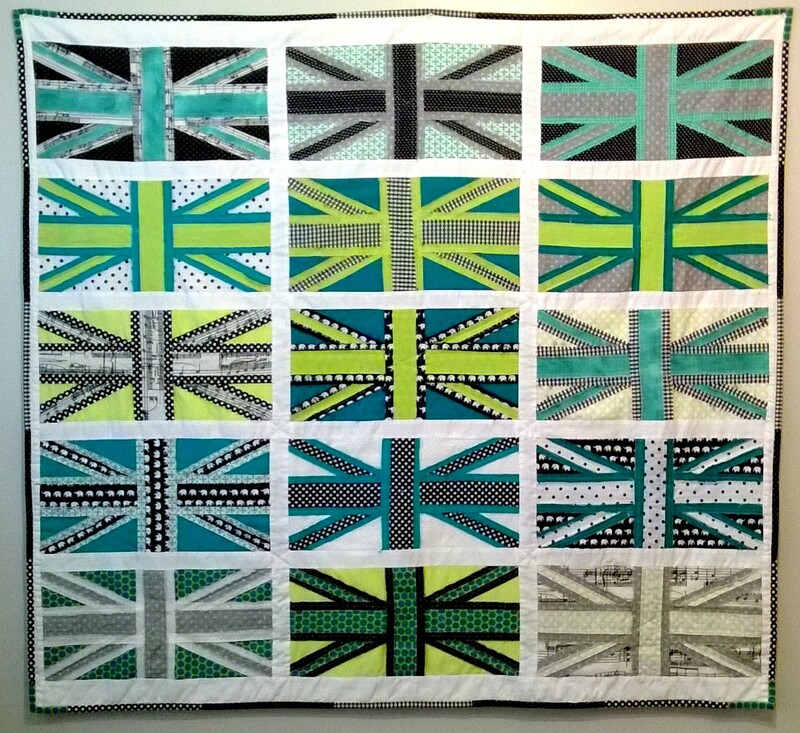 The pattern I used for this quilt was the Lizzie B Cre8ive - I Heart London – Quilt Pattern which you can purchase from her website here. I’m going to be honest – this pattern is not for the faint of heart! It calls for 12 different fat quarters and ¼ yard each of 24 different fabrics – which can be a challenge if you don’t already have the fabrics in your stash. 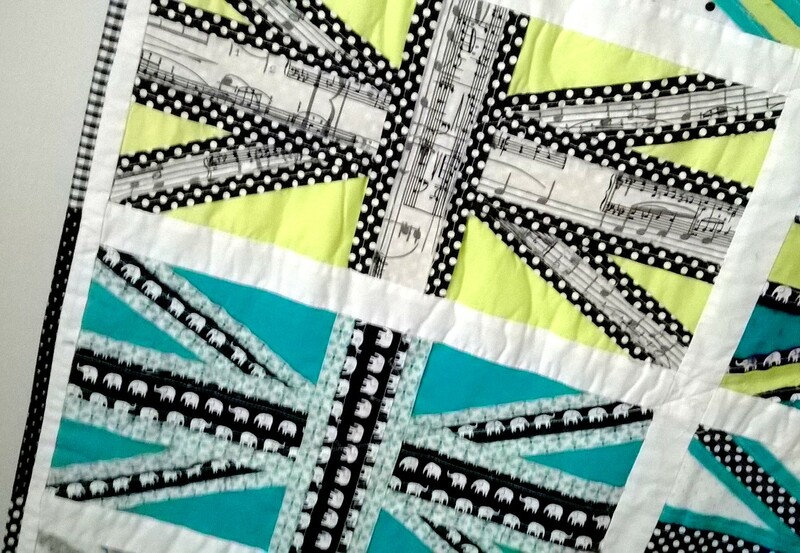 I chose to narrow the color scheme of my quilt to four different colors to match my daughter’s room which we redecorated for her birthday last year, which has a Paris, London New York theme in Turquoise, Black, white and Lime Green for an accent color. While it was challenging to find different fabrics in the right colors - I was excited to find fabrics with some of her favorite things like elephants and musical notes for her love of singing. I also didn't make the quilt as big as the pattern calls for – I think It’s about three rows shorter than what the pattern calls for. As for the binding – I originally had chosen a black and white fabric with peace signs but I hated the way it looked – so I ended up improvising and making the binding from leftover strips. I’ve just posted two quick and easy projects that would be perfect for Mother’s Day, any special occasion or for yourself! The first one is a Fabric Flower Pin – it’s great for using up all those fabric scraps that you’ve been hanging on to. Makes a great accessory - pin it to a favorite Jacket, belt or purse and a great gift for Mom! You can find her awesome tute here. The second one is truly a favorite of mine. It came about after weeks of searching for kitchen linens that I actually liked and that didn’t break the bank. After having very little success finding what I wanted – I decided to make my own! Duh! 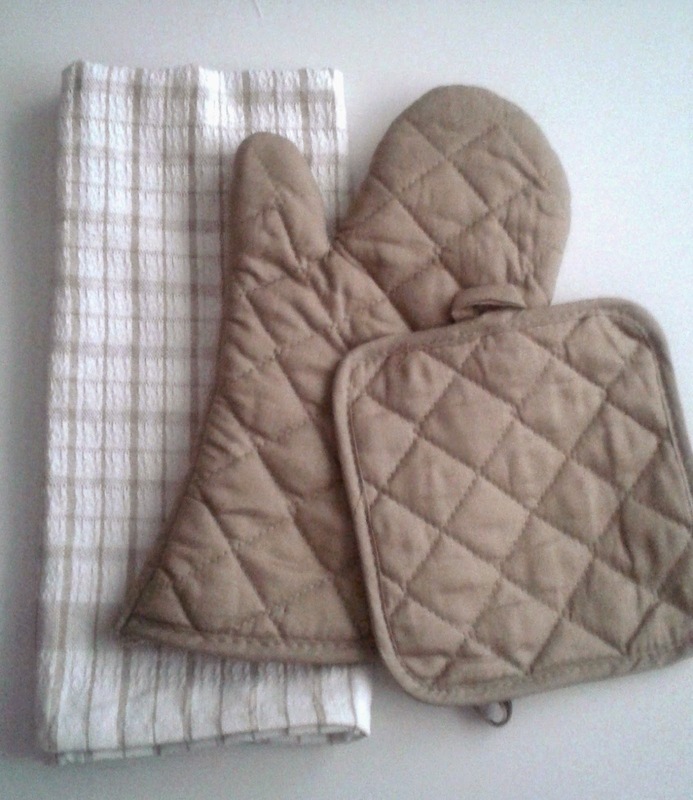 The inspiration came from a post, by Desiree of the36thavenue.com, on how to doll up dollar store oven mits. You can find the tute here. 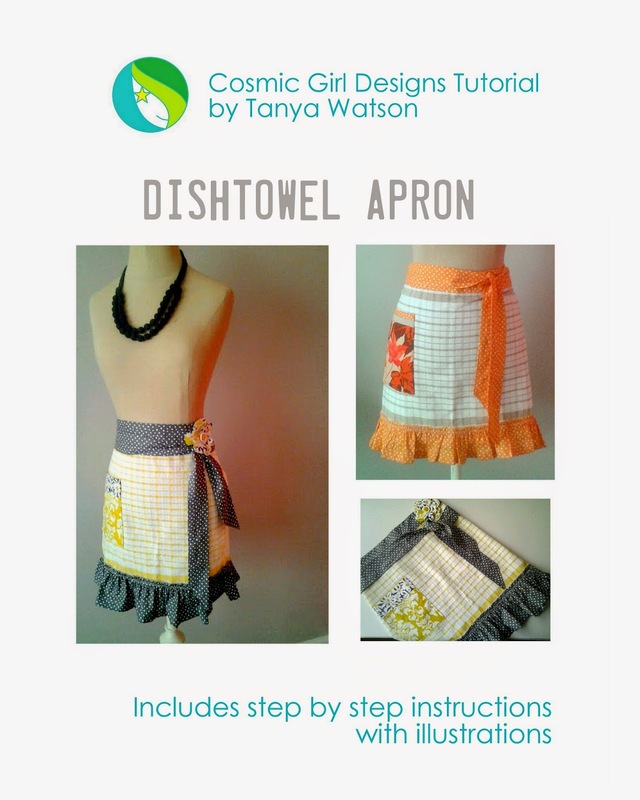 Ok back to the apron – anyway after I made my pot holders I thought why not use a dish towel from the Dollar Store as the foundation for my apron. This towel was actually purchased at Dollar General for $2 but hey, still great bargain. I think using the towel is great for drying your hands and it makes me less weary of staining nice fabric – I also included a pocket to tuck my IPod into. So cute apron + wine + good music equals a great time in the kitchen to me! Here's how mine came out. 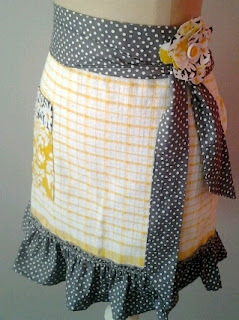 You can find my apron tutorial in my Craftsy pattern shop here. 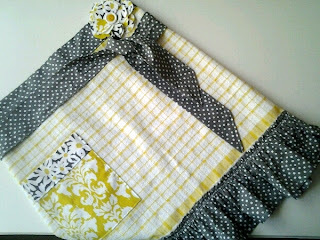 After I made my apron, I thought hey – this would be great to make for my Mom. Not sure if she would wear it, but I’m sure she’ll still hang it in her kitchen with pride; as all us Mom’s love to display our kids creations with pride. Here's the apron I made for Mom with matching mits. I hope she likes it. Happy Mother’s Day to all you Moms and Female Nurturer’s – your efforts are greatly appreciated! Here’s a quick and easy project to make for all the wonderful women in your life this Mother’s day! 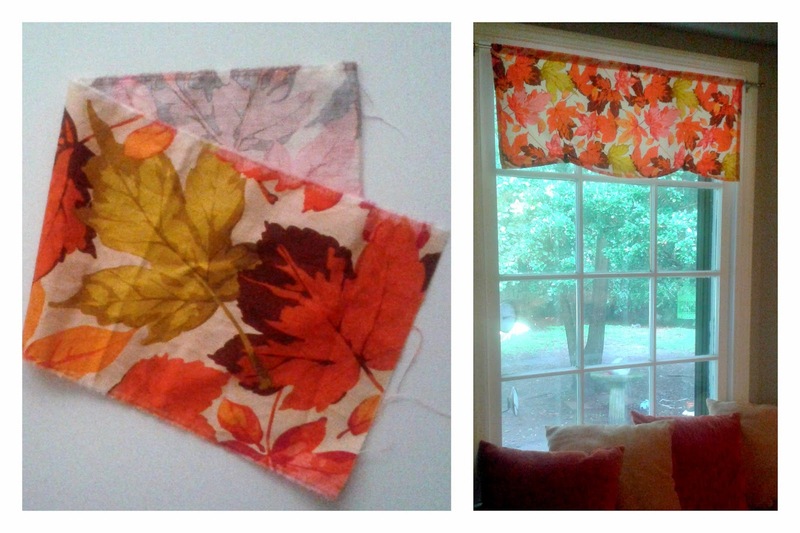 · Four 4”x4” squares of fabric: 2 in the same print; 1 in a coordinating print and 1 in a contrasting print. · One piece of scrap fabric for the front of your card. 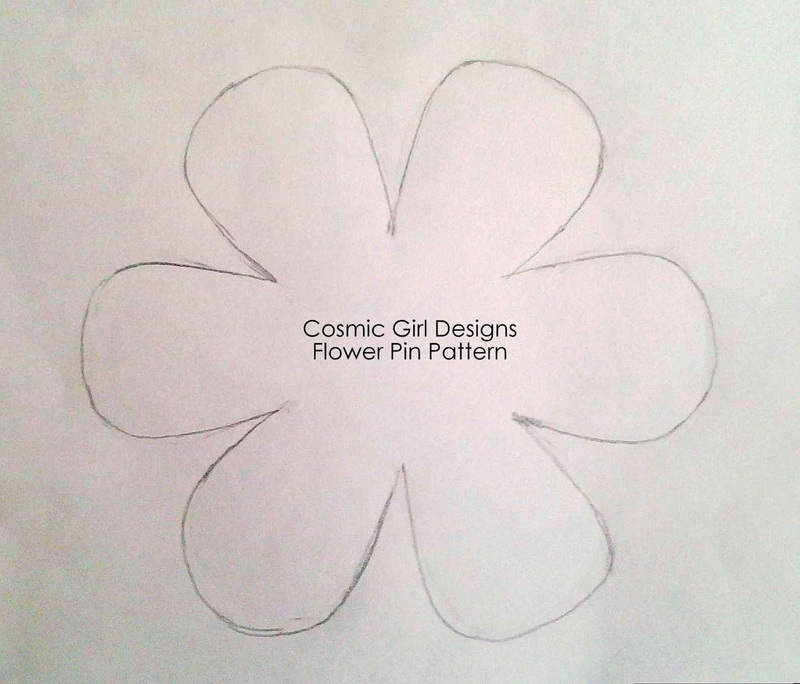 Trace the flower pattern onto a piece of freezer paper or regular paper. 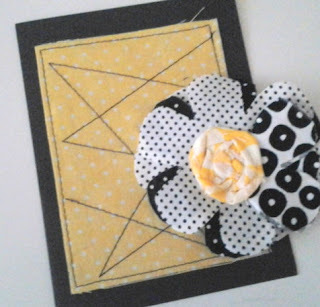 Stack your 4” fabric squares and place the flower pattern on top of the stack. 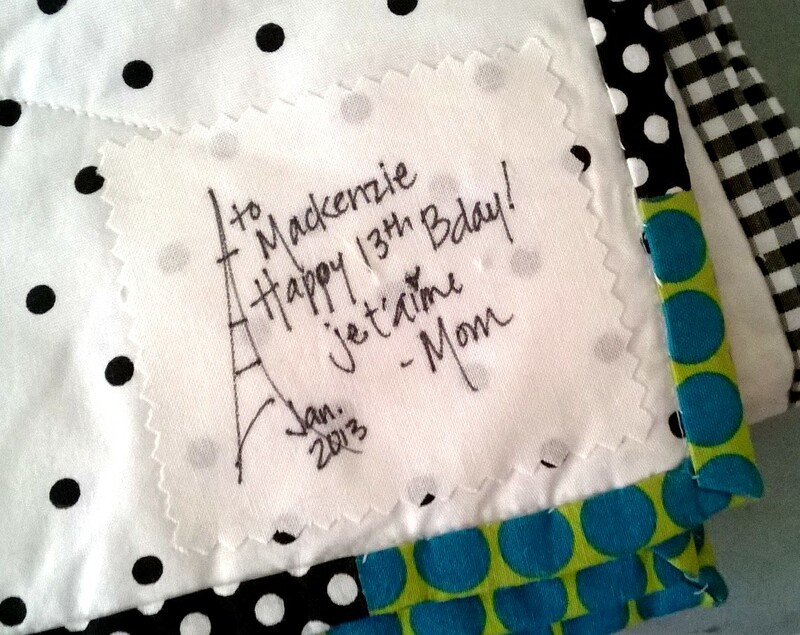 If using freezer paper then iron on the pattern to the top layer of the stack. 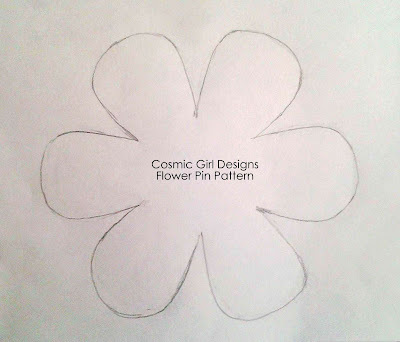 Otherwise just pin the pattern on top and cut out the flower shapes. Layer three of the flower pieces; placing the contrasting flower piece in between the two layers so that the petals from the contrasting fabric is showing in between the bottom and top layers. Fold the fourth and final flower shape in half, wrong sides facing, to create a leaf shape for your flower. Place the leaf shape in the center of the flower stack and secure in place with a few stitches through the middle; making sure to secure all the layers including the leaf. Take your fabric strip and tie a knot at one end. Secure it to the middle of the flower stack with a few stitches. Begin twisting the loose end of the fabric strip and then wrap it around the knot in the center – secure with stitches with embroidery floss as you go around. Don’t worry about the stitches showing – this adds texture and interest to your flower. 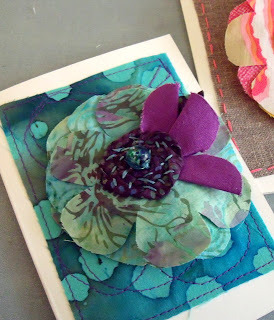 Take your remaining fabric scrap and sew it to the front of a blank card. Move the card around while on the machine to create a funky pattern. 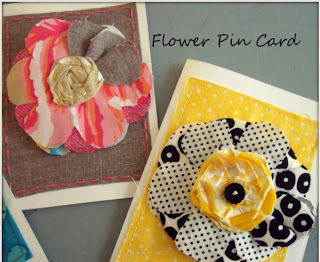 Pin the flower to the card to give to someone special! 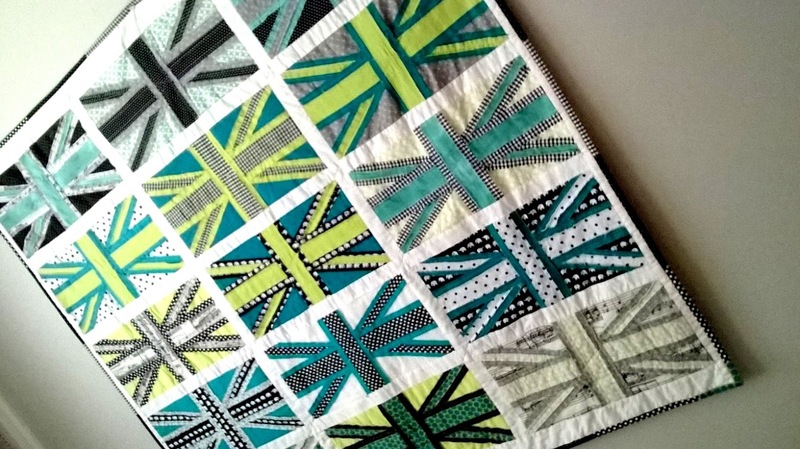 If you live in the Charleston area and would like to make this project, I'll be hosting a Make and Take at People, Places and Quilts in Summerville, on Friday, May 10th. Go to my Classes Page to learn more. Hi. Sewing is my first love, but I also enjoy exploring all things crafty and creative. © 2009–2012 by Tanya Watson, Cosmic Girl Designs. Theme images by Ollustrator. Powered by Blogger.